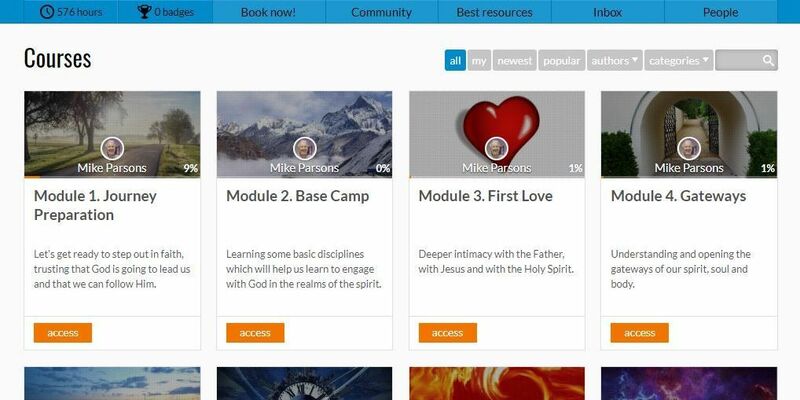 Once you have subscribed, and each time after that you login to the site, you will see a page like the one below, featuring all the 'Engaging God' modules covered by your subscription. You will also see a number of other courses or teachings labelled either 'free' or with their price. These are not part of 'Engaging God', but members of this community have asked for them to be included here. Please do explore the free ones if you wish. Later in your journey you may wish to purchase some of the 'paid for' teachings too - this is entirely up to you. In the example above, the blue 'all' tab is selected. You may also choose to filter the options visible by using the other tabs. In most views, there will be more than one page of courses/modules, and you can see the next page by clicking the arrows to the right or left of the page, or by scrolling down below the listed courses and selecting the next page number. Start with Module 1 and work through them in order. Click the orange 'access' button on the module to begin. A page will open like the one below. When you click on the long orange button in the blue top section, or on one of the activities listed further down the page - in this case, the first video in section 1 - the media player will open. In the image below, the activity selected is seen in the window to the right of the page. To watch a video, click the ‘play’ button in the centre of the video image to begin playback (in some browsers it may start automatically). You can use the buttons which appear in the lower right of the video window to make the video fullscreen and to change the playback speed and volume. If you wish, you can interact with other members by clicking the 'Learners' and 'Discuss' tabs towards the top left of the screen just below the Module title. Work through the activities listed in the left menu. A green check mark should appear against any item you have opened in the left hand menu to enable you to track your progress. When you log out, the system will remember how far you have previously reached and next time you login will be ready to start again where you left off. You can hide the left hand menu by clicking the small double arrows next to the Module title. Similarly, when the left hand menu is hidden, click the small double arrows in the top left of the screen to show it again. Exercises: Some videos contain exercises, which you may want to repeat several times. In many cases, we have made a shorter video of just the exercises, and this displays as a smaller video below the full size one in the video window. For each video listed, there is also normally an audio alternative immediately below it in the list (left-hand menu). You can watch or listen, the choice is yours. If you see a 'paperclip' icon at the top right of a video window, it means there are accompanying PDF files you can download by clicking on it. If there are 2 PDF files, one will be the actual slides from the presentation and the other a text version of the content of the slides suitable for printing if you wish. For your convenience we also allow downloading of audio and video files. However, please remember that you only have the right to use these materials while you remain subscribed, and that should you unsubscribe we will ask you to delete any materials you have downloaded and destroy any printed copies once your subscription ends. This does NOT apply to any paid-for teaching which you may have purchased outright. To download audio or video files, please scroll down the left-hand menu to the last-but-one section in each module, 'Optional audio downloads'. 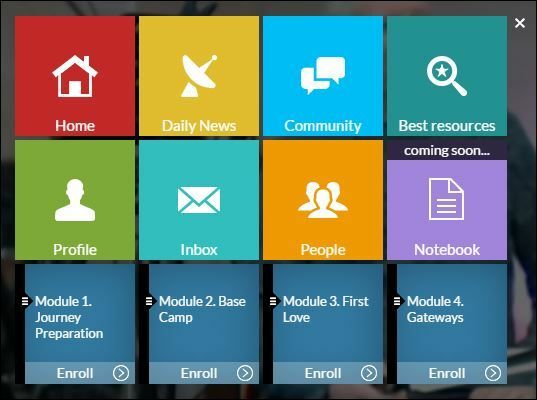 Clicking the small butterfly logo (top left of most pages on the site) opens a grid view (below) from which you can choose to open a module, go to ‘Home’ page, participate in the community and other options. Do check them all out sometime, especially the 'Best resources'! This Engaging God website is fully responsive and will display on all your devices. We recommend a laptop running Windows 7 or later and the Chrome browser, but other configurations may be used. You will need a good internet connection, especially to stream video. If you do not have a fast download speed you may prefer to work with audio instead. Downloading to mobile devices may not be supported. And we definitely do not recommend trying to do the whole thing just on a smartphone! We hope you'll stay with us, but we do recognise that 'Engaging God' may not be right for everyone. To unsubscribe, please go to the Your Account tab (top right of most pages) where you will see the options for managing the status of your subscription. If you unsubscribe you will still retain access to all your modules until the end of the period you have paid for (or your free trial period). If you have previously purchased teaching which you have paid for outright, we recommend you download the files from the optional downloads section of that teaching. In accordance with the terms and conditions to which you agreed when subscribing, we will ask you to delete or destroy all copies of any other material downloaded from the site when you leave. 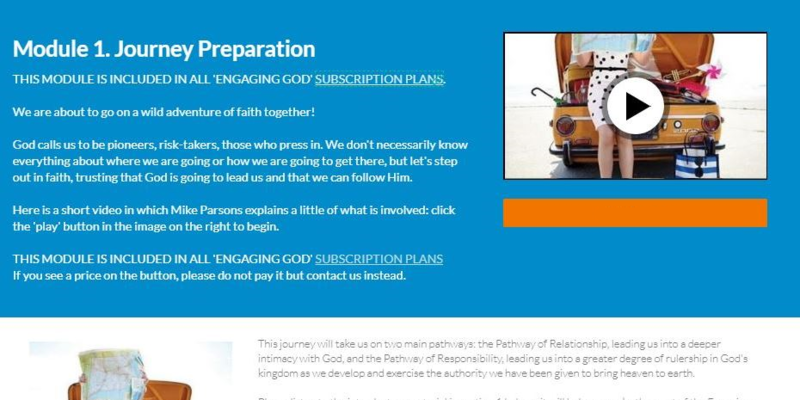 But unsubscribing from 'Engaging God' does not mean that you will not be able to use the site at all - you will still be able to access free content here and make any purchases if you wish. You can, of course, resubscribe at any point in the future. If you run into any difficulties, please contact us and we will do our best to help you. We are normally available during UK office hours Monday to Friday and may also be able to respond at other times.